I use textbooks, scripted curriculum, workbooks and we don’t do projects. If I said that among classical homeschoolers I would receive startled glances. The Charlotte Masonish homeschoolers would be horrified. Unschoolers would be appalled. I’m still in shock myself. This is not quite what I had in mind at the beginning of our journey. I’ve found that sometimes your homeschool doesn’t look how you might have envisioned. I always thought we would create our own curriculum from a vast array of living books and historical biographies. I guess I thought we would just float through our days filled with projects and experiments and the library would be our second home as we checked out a 100 books every week. My kids just want to finish school each day. They want to get through my lesson plans and venture off to explore and play on their own (which is still learning, yes). And I want that for them. I want time for spontaneity, play, and relaxation in our day. So, as I’ve struggled to change my vision for school I’ve learned a few things. I’ve found that textbooks are quick and efficient. We learn the major ideas on a topic in an organized manner and still have the option to dive deeper and explore an interest if we would like. Using a textbook allows all of us to see our progress. We mark our pages and know that we hope to finish the text by the end of our school year. It helps to see the end point. I have an affinity for scripted curriculum. I did not think I would enjoy someone else telling me what to do and exactly what to say for each lesson. But, as a matter of fact, I do. I actually am loving the concept of a scripted curriculum right now. Each day I can open the teacher manual to the next page and begin reading. I don’t have to spend extensive time planning or reading the lesson beforehand. I don’t have to struggle to explain a topic I fully understand to a child who isn’t grasping the concept (i.e. direct objects and predicate nominatives) nor do I have to fumble for words as I explain a concept that is somewhat nebulous to me (i.e. chemical equations, molecules, and compounds). In either situation, I just use the words that are written carefully on the page, taking the pressure off myself to hunt for the right words and examples as I teach. My kids also enjoy workbooks. They like the independence of having their own workbook to write in and complete without too much oversight from me. The workbook pages tell them what to do and they jump right in and work on their own. Again, I think they like seeing the progress of completing one page per day and moving closer to the end of their books. And I’ve found that many of the workbooks give them excellent practice and reinforce the concepts we are learning. Call me lazy but I don’t enjoy projects right now. It might be because I have two toddlers who enjoy destroying anything we create. It might be because my oldest kids haven’t quite become proficient in cleaning up their own messes. Or it might be because I would like to find a little extra free time for myself in our schedule. Projects take an inordinate amount of time from the gathering of supplies, to the set up, to the execution, and then to the clean up. School takes most of our day with frequent interruptions and 5 kids to squeeze into the schedule. Therefore, projects and experiments have been pushed out of our day. Now, do understand that we have 3 bookshelves and two linen closets full of wonderful literature, non-fiction books, and historical fiction. We read together every single day. We take time to explore our own ideas and questions. At our house we use more than just textbooks and workbooks. We utilize classically-based resources and living books, we create notebook pages, we complete a few projects, and we sometimes do experiments. However, I’ve found that I had to change my idealized version of homeschool to become more efficient and streamline my day. After all, I don’t want to wear my teacher hat all day. I’m a wife and mom too. It’s all about balance. Confession is good for the soul. 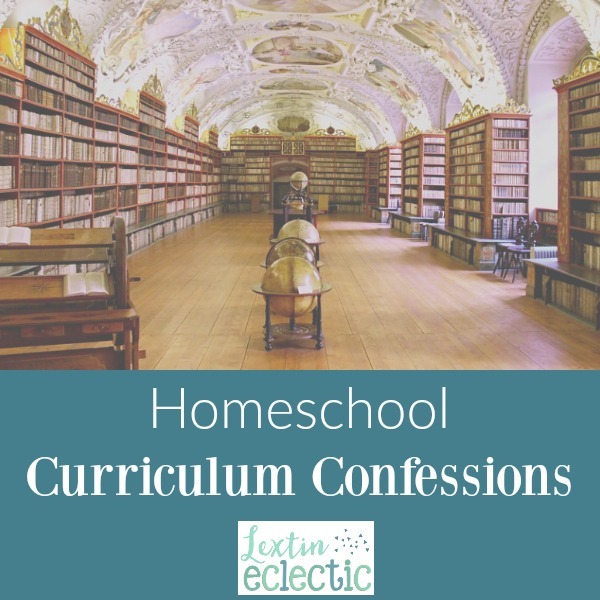 Do you have any curriculum confessions that you would like to make? It’s ok, go ahead and say it aloud! Thanks! I've really had a hard time finding the right balance this year. This post is so real and honest and I KNOW there are many moms out there breathing a sigh of relief at the pass you just gave them! This is exactly us. Except we do much of our work orally, my young sons hate writing. And the rest of the day is for exploring our collective and individual interests. I'm more of an unschooler than homeschooler and I assure you, I'm embarrassed to say that I do NOT use textbooks, scripted curriculum, workbooks and such. Not for myself or my family but for everyone else that is bothered by it. I say do whatever works for you and you won't hear my calling you lazy. More like Superstar. Thanks for stopping by Journeys of The Zoo and good luck with our giveaways. I would classify myself as a Charlotte Mason type homeschooler, however as the years go by, and having lots of kiddos to teach, I have found myself drifting more toward your way of thinking. Projects are nice, but they can become time consuming, expensive and in the end they usually end up crumpled under someone's bed! I like the idea, too of being able to let them do their work and then go do what they love! And honestly, it would be nice to have a little time to do what I love 🙂 Thanks for your post! It's nice that we have the freedom to make changes as we see fit. I have found that I've needed to streamline things lately. It's so freeing to not have so many projects and pieces floating around! I love that my kids can have so much play time or time to explore their own ideas and projects without direction from me.